$126.917 million on 4260 screens. When a legendary movie franchise returns after a long hiatus, the results don’t usually seem to be pretty. In 1990, The Godfather Part III attempted to live up to its two classic predecessors and failed miserably; it offered a decent flick at best, but not one that remotely compared to the earlier movies. The Star Wars series returned from a 16-year break with 1999’s The Phantom Menace. Though the flick earned tons of money, it inspired widespread derision from fans. Very few – if any - find the “Prequel Trilogy” to match up to the “Original Trilogy”, and many fans see Phantom Menace as the worst of the bunch. Back in the 1980s, the Indiana Jones films reigned supreme. 1981’s Raiders of the Lost Ark, 1984’s Indiana Jones and the Temple of Doom and 1989’s Indiana Jones and the Last Crusade all found massive audiences and entertained a generation of fans. And that was that. Crusade ended with Indy’s literal ride into the sunset, and we never figured to see him on the big screen again. However, rumors persisted for years that a fourth Indy flick would materialize, and after many aborted attempts, the franchise finally came back with 2008’s Indiana Jones and the Kingdom of the Crystal Skull. Commercially, the film was a hit. It made $312 million, a figure not reached by the first three movies (unless we adjust for inflation, of course). This seemed to be a “soft” blockbuster, though, as Skull appeared to fail to inspire the popular response that greeted The Dark Knight and Iron Man. I think the Indy reputation drew in fans more than anything about Skull itself. Set in 1957 – 19 years after the last Indy adventure - Skull takes our hero (Harrison Ford) to a secret military base in the Nevada desert. Soviet spies captured him and his cohort George “Mac” McHale (Ray Winstone) so they could make sense of a mysterious discovery. Led by a mysterious psychic named Colonel Dr. Irina Spalko (Cate Blanchett), the Russkies want Indy to help them with the remains of an alien who crashed at Roswell 10 years earlier. In the midst of this, Indy starts to make his escape, only to find his “buddy” Mac sold his services to the Reds and turns on him. Even without Mac’s help, however, Indy inevitably finds his way out of the bind and escapes, though the Soviets manage to make off with their prize. When the FBI interviews him, they suspect he aided the commies, and he loses his teaching job due to the witch hunt environment. 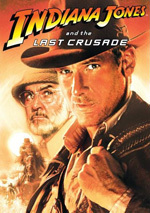 Before Indy leaves town, however, he learns that an old colleague named Professor Harold Oxley (John Hurt) has been abducted and will be killed without intervention. He learns this from Mutt Williams (Shia LaBeouf), a young greaser close to Oxley. They discuss a spooky crystal skull that may be used to open the powers of a mystical lost Amazonian city called Acator. Thus launches Indy’s big quest to find Oxley, outwit Spalko, and solve the mystery of the crystal skull. When I took in my theatrical screening of Skull, my friends all asked me what I thought of the flick. I deferred an answer simply due to a need for perspective. 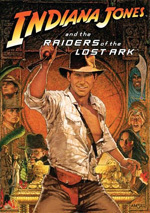 Like other Indy fans, I’d waited almost two decades for another adventure, so it seemed awfully premature to pass much judgment on it after only one viewing. I’d seen each of the other Indy flicks a minimum of 10 times apiece and had been able to re-evaluate them over decades, so I didn’t want to make any hasty proclamations about Skull. Right now, I think it’s a perfectly entertaining movie, but it’s not in the same class as its predecessors. Honestly, it can be tough for me to separate my feelings about the film that exists and the film that I hoped to see. Just as The Godfather Part III and The Phantom Menace suffered from years of pent-up anticipation, fans entered Skull with enormously high expectations. Someday I’ll be able to view the flick better on its own merits, but right now I think it’s difficult for me to watch Skull without the interference of my dreams of what could have been. I feel that Skull provides the most muddled of the four Indy movies. If you look at the stories of the first three, they’re all pretty simple in terms of what Indy needed to do. Raiders and Crusade went with basic quests to find magical objects. Temple was a bit more complex due to the elements with the religious cult and related complications, but it still was pretty simple good vs. evil. Some of that informs Skull, and viewers will likely experience some déjà vu, as the flick’s Soviets play and feel an awful lot like the Nazis in Raiders and Crusade. It’s as if the folks behind Skull just took the old German antagonists and slapped new clothes on them; there’s very little to distinguish this flick’s Soviets from the Nazis of the earlier two movies. That’s one moderate drawback, as it’d be nice to get some villains who feel less familiar. I realize that Skull has a tough time related to its distinction between familiarity and originality. On one hand, viewers want something that bears the unmistakable Indiana Jones feel, but on the other, they want something fresh and new. Like Crusade, Skull probably relies a little too much on the tried and true, though unlike Crusade, it doesn’t bring a lot of verve to the presentation. While Crusade definitely smacked of Raiders Revisited, it had enough pizzazz behind it to succeed. If nothing else, the chemistry between Ford and Sean Connery made it a delight. No such sparks fly in Skull. Clearly the movie wants to make Ford and LaBeouf into a new team, but they don’t really connect, at least not on a level close to that of Ford and Connery. Ford and LaBeouf do fine together, but their interactions never boast much zing. We always feel like LaBeouf is there mostly to be groomed as a future action star, not because the story really needs him. Mutt is a generally forgettable character. At least Skull offers the revival of Ford. He’d lost a lot of his movie star luster in recent years, and he often seemed bored in the films he did. His return to Indy gives him a real spring in his step and demonstrates that he still has life to him. Ford is the best thing about the movie, as he almost recaptures the spirit of the earlier movies. I recognize that this review largely consists of complaints, and that displeases me. In truth, Skull offers an entertaining little flick. It has a mix of good action scenes and just enough excitement to keep us interested. The problem stems from my feeling that it simply doesn’t live up to its predecessors. Skull offers a generally good action film, but that’s not quite enough when one considers the legacy of the Indiana Jones series. Chalk it up as a bit of a disappointment, but an enjoyable one. 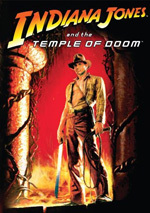 Indiana Jones and the Kingdom of the Crystal Skull appears in an aspect ratio of approximately 2.35:1 on this Blu-ray Disc. Virtually no concerns occurred here. Sharpness looked positive. A couple of early shots looked a smidgen soft, but those weren’t a distraction. The vast majority of the movie boasted excellent clarity and delineation. No issues with jaggies or moiré effects occurred, and edge enhancement remained absent. As for print flaws, they stayed away here. I noticed no signs of any defects in this clean and distinctive image. Colors looked solid. The often gold-tinted movie didn’t present the world’s broadest palette, but it included a good enough range of hues that consistently came across as tight and vibrant. The tones never seemed overly heavy, and the film gave them good definition. Black levels seemed deep and dense, and low-light shots demonstrated fine clarity and never became too thick. I found little about which I could complain as I watched the consistently positive visual presentation of Skull. In addition, the Dolby TrueHD 5.1 soundtrack of Indiana Jones and the Kingdom of the Crystal Skull seemed very good. The mix offered a broad and engaging experience. Music showed nice delineation and spread, and the effects created a good sense of atmosphere. Effects seemed appropriately placed and blended together smoothly. Those elements moved cleanly across the channels to demonstrate a fine feeling of place. Surround usage was strong. Quite a lot of information – from bullets to explosions to vehicles to spooky skull effects -–popped up from the rear, and the back speakers acted as an active aspect of the mix. The track didn’t often dazzle and present a stunning surround mix, but it provided a consistently engaging affair. Audio quality appeared fine. Speech was distinct and concise, and I noticed no issues connected to intelligibility or edginess. Music was fairly vibrant and dynamic, as the disc displayed the score with vivacity and solid clarity. Effects were clean and rich, and they never suffered from any signs of distortion or other problems. Bass response was deep and firm and brought good punch to the package. I liked this track quite a lot and thought it merited an “A-“. How did the picture and sound of this Blu-ray compare to the film’s DVD version? I thought the audio was a bit stronger, as the TrueHD track sounded somewhat perkier and more dynamic. The Blu-ray’s visuals easily won the contest, as this disc looked significantly tighter and more dynamic. The Blu-ray was a terrific visual presentation. Across this two-disc Special Edition, we find a mix of extras. On Disc One, two programs appear. The Return of a Legend lasts 17 minutes, 37 seconds and provides notes from director Steven Spielberg, producer Frank Marshall, story/executive producer George Lucas, screenwriter David Koepp, executive producer Kathleen Kennedy, and actors Harrison Ford, Karen Allen, and Shia LaBeouf. “Return” looks at the decision to bring back the franchise, story issues and script development, challenges connected to staying true to the Indiana Jones world, cast and characters, some influences, and the flick’s title. Across this set’s two discs, we’ll encounter a lot of this sort of material, and “Legend” launches these components well. Not only does it feature all the prominent participants, but also it spills some good dirt, primarily when Spielberg gripes about how he never really wanted to do another Indy flick. The featurette provides a slew of interesting details and proves to be quite entertaining. Disc One also features the 11-minute and 47-second Pre-Production. It features Spielberg, Ford, Lucas, LaBeouf, Kennedy, pre-visualization supervisor Daniel D. Gregoire, director of photography Janusz Kaminski, and Ford’s costume designer Bernie Pollack. The show looks at pre-viz, cinematography and visual design, costumes, new cast, training, and what it felt like to return to the franchise. It offers a good continuation of the trend started with “Legend” and provides a consistently satisfying little piece. Some ads appear in the Trailers heading. This area presents “Theatrical Trailer 2” and “Theatrical Trailer 3”, which makes me wonder what happened to “Theatrical Trailer 1”. Exclusive to the Blu-ray, we find Indiana Jones Timelines. This splits into three areas, all of which feature text and video information. “Production Timeline” starts in December 1992 and follows the film’s progress through April 2008. “History Timeline” runs from 1546 and the death of Francisco De Orellana through the publication of Chariots of the Gods? in 1968. Lastly, “Story Timeline” traces various events in and connected to the movie’s tale. Of the three, “Story” is the least interesting, as it doesn’t add any details or background to what we already know. Heck, it doesn’t even bother with dates; it just lists events like “Henry Jones, Sr. dies” without anything more to it. “Production” is pretty good; while most of the information appears elsewhere in this set, it’s nice to see it told chronologically. “History” is the best of the three, as it throws out perfunctory but still useful details about elements connected to the movie. Note that the text side of things does all the heavy lifting here. The video clips are all very brief and are often barely worth the effort to watch them. The text provides greater depth and becomes much more worthwhile. Over on Disc Two, the main attraction comes from a six-part documentary called Production Diary: Making Kingdom of the Crystal Skull. It fills a total of one hour, 20 minutes and 11 seconds, as it presents comments from Spielberg, Lucas, Marshall, Ford, LaBeouf, Kaminski, Koepp, Allen, Pollack, Kennedy, supervising location manager aerial unit/production supervisor Mike Fantasia, costume designer Mary Zophres, production designer Guy Hendrix Dyas, property master Doug Harlocker, co-costume designer Jenny Eagan, stunt coordinator Gary Powell, co-producer/unit production manager Denis L. Stewart, special effects coordinator Dan Sudick, hair department head Kelvin R Trahan, Stan Winston Studios effects supervisor John Rosengrant, snake handler Jules Sylvester, makeup artist Bill Corso, set decorator Larry Dias, first AD Adam Somner, and actors Ray Winstone, Cate Blanchett, Jim Broadbent, Igor Jijikine, and John Hurt. “Diary” covers the start of the shoot in New Mexico, other locations and set design, stunts, special effects and second unit work, new cast and characters, costumes and props, lighting, and a few other topics. “Diary” presents a very good mix of on-set footage and interviews. The former shots give us a great glimpse of the actual production, while the latter offer solid perspective. “Diary” continues the fine work from Disc One’s featurettes to create an engrossing examination of the various production topics. Six more featurettes show up on Disc Two. Warrior Makeup goes for five minutes, 37 seconds and include notes from Trahan and makeup department head Felicity Bowring. As you might guess, this show looks at the work done to give the South American warriors their distinctive looks. Short and tight, we learn a lot here. For the 10-minute and 13-second The Crystal Skulls, we hear from Spielberg, Ford, Lucas, Dyas, and Rosengrant. We get some thoughts about the real-life inspirations for the movie’s skulls as well as their film design and creation. Expect another concise and informative piece that deserves a look. Iconic Props goes for 10 minutes, four seconds and features Spielberg and Harlocker. The shows concentrates on elements unique to Skull but also tells us a little about returning pieces like Indy’s whip. Harlocker gives us a nice tour of these items and lets us get a good look at them. Next comes the 22-minute and 44-second The Effects of Indy. It provides info from Spielberg, Lucas, ILM digital artist Paul Huston, ILM animation supervisor Steve Rawlins, ILM digital model supervisor Dave Fogler, ILM view paint supervisor Steve Walton, ILM digital compositing supervisors Sean MacKenzie and Jay Cooper, visual effects supervisor/aerial unit/unit director Pablo Helman, ILM digital matte supervisor Richard Bluff, Kerner Optical model supervisor Brian Gernand, ILM lead TD supervisor Craig Hammack, ILM associate visual effects supervisor Marshall Krasser, ILM digital production supervisor Jeff White, ILM creature and simulations supervisor Eric Wong, Kerner Optical lead model maker Nicholas A. D’Abo, and ILM visual effects art director Christian Alzmann. While the prior programs included some notes about practical effects, this show looks exclusively at CG elements, models and miniatures. Though a bit dry at times, “Effects” covers its topics well and turns into another valuable show. After this we get Adventures in Post-Production. The 12-minute and 47-second piece involves Spielberg, Marshall, Kennedy, editor Michael Kahn, sound designer/supervising film editor Ben Burtt, re-recording mixer/additional sound design Christopher Scarabosio, and composer John Williams, We go over editing, sound design, and music. Don’t expect much about the editing, as the featurette barely discusses that topic. However, we get very good notes about the audio, and Williams includes some nice thoughts about his score. Those aspects of the piece make it worthwhile. For the final featurette, we find the three-minute and 45-second Closing: Team Indy with a few remarks from Spielberg. However, it essentially acts as visual credits for the movie, as it spotlights many of the folks who worked on the flick. That makes it nice for them but not essential for us, especially since we already got to know most of them through the featurettes. Three Pre-Visualization Sequences fill a total of 14 minutes, 16 seconds. We get “Area 51 Escape” (3:54), “Jungle Chase” (5:50) and “Ants Attack” (4:32). These let us see crudely animated renditions of the various movie scenes. I’d have liked to view them as comparisons with the final flick, but they’re still cool. Under Galleries, we see stills under five subdomains. These cover “The Art Department” (168 images across three sections), “Stan Winston Studio” (76 across two areas), “Production Photographs” (72), “Portraits” (63) and “Behind-the-Scenes Photographs” (39). All include nice shots, though the first two provide the most valuable production information. After 19 years out of cinemas, could the return of Indiana Jones live up to expectations? I think it could have done so, but it didn’t. Indiana Jones and the Kingdom of the Crystal Skull provides an amiable and occasionally exciting affair, but it’s not one that matches up particularly well with its three predecessors. Though it shows periodic signs of life, it doesn’t maintain them strongly enough to become better than “pretty good”. As for the Blu-ray, it provides very good picture, audio and extras. 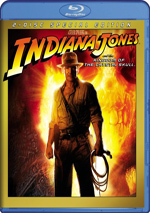 I like the movie and the package enough to recommend it, but don’t expect classic Indiana Jones. Fans should definitely pursue this Blu-ray version, though, as its picture quality makes it by far the best representation of the film.